When this writer first heard the HKDuo some twelve or thirteen years ago, their four-hands Nutcracker suite (especially the March) was so awesome that I had to immediately seek out the music—that was before IMSLP was set-up. Now, although the lure of Tchaikovsky’s Nutcracker has not dwindled, it was a very pleasant surprise to arrive at the Helena May’s concert to find a different Nutcracker—Carl Reinecke’s The Nutcracker and the Mouse King—as the first item on the programme. Carl Reinecke (1824-1910) can be easily confused with two other equally peripheral names in classical music: Johann Adam Reincken (1643-1722) whose keyboard pieces were much admired and adapted by a young J. S. Bach, and Anton Reicha (1770-1836) who produced a comparable amount of music as his friend Beethoven. One thing that can identify Reinecke from the other two though is his recorded legacy in the form of piano rolls, which includes Haydn’s E-flat piano sonata (No. 52) and his own Nutcracker (with his wife as the other pianist); both are available on the internet. As to the music, his Nutcracker is equally charming as Tchaikovsky’s with its depictions of the ballroom scenes and the clockwork music box and other toys. 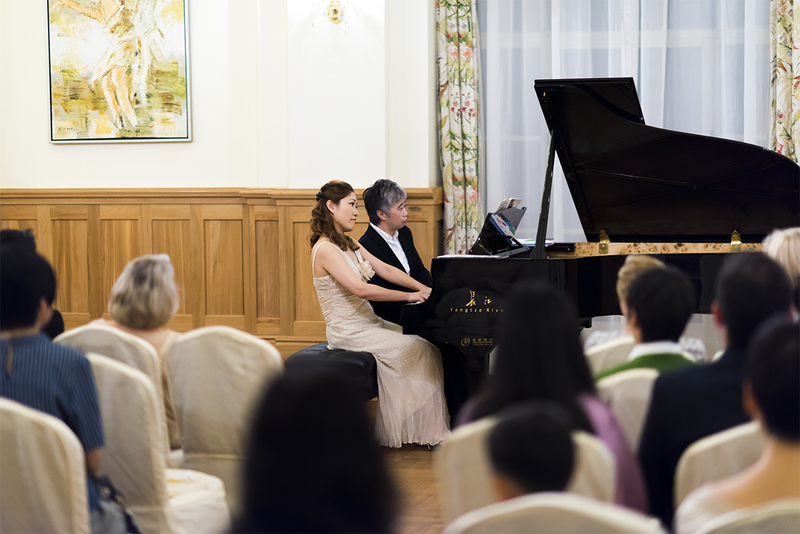 His control of the high register is especially fine, and credit must be given to the HKDuo here for bringing to life his delicate four-hand writing, and the overall impression is that the music really fits the four-hand idiom—a quality that is not often the case. The other items on the programme are Julie Kuok’s composition The Fantasy of Little C and Gershwin’s Rhapsody in Blue. Ms. Kuok’s Fantasy is a set of ten pieces for children, and like the children music of Prokofiev and Bartók, this is music written with great wit and will surely be treasured by students and teachers alike.